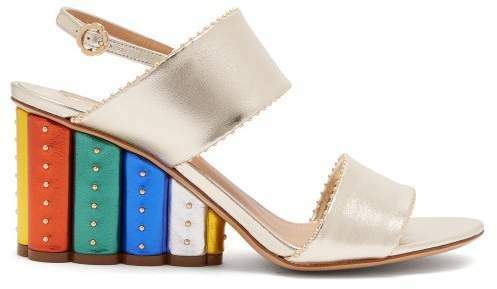 Salvatore Ferragamo - Italian luxury references 1970s flower-child in Salvatore Ferragamo’s rainbow-heeled Gavi sandals. 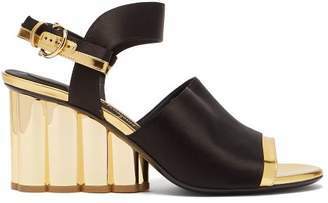 The pale-gold leather is accented by stud-embellished columns gathered into a wedge heel, while slingback straps and flower-shaped buckles finish off the design. 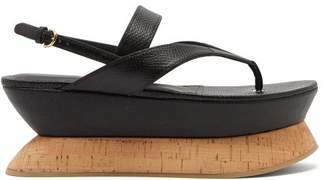 Pair them with sophisticated accessories for an evening occasion.